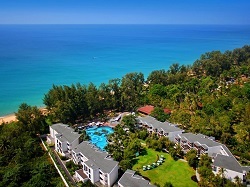 Mai Khao Beach is located on the northwest coast of Phuket stretching 9 kilometres in length, from the airport right up to the northern tip of the island near the Sarasin Bridge. This is the longest beach in Phuket with little development, and one of the best beaches in Phuket to get away from the crowds. Mai Khao beach is just one of three Phuket beaches that lie within the Sirinath National Park. The area was declared National Park in 1981 to protect the declining number of sea turtles. If your lucky from November to February you may see, sea turtles come ashore to lay their eggs, then in April the young hatchlings are released back into the sea. Although the beach is in the Sirinath National Park, most of it is free to access. If you enter from the southern tip where it joins Nai Yang Beach you maybe charged an entrance fee of around 100 baht for tourists. Activities on Mai Khao beach are very low key, there are no jet ski's or banana boats. However it is a fantastic spot to relax and take in the scenery, or take long walks along the unspoilt beach. Swimming at Maikhao Beach can be dangerous from May through to November. The main attraction at Mai Khao Beach is the National Park, which covers an area of 90 square kilometres. The National Park stretches west from Phuket's International Airport all the way up to the northern tip of Phuket, including the northern Phuket beaches Maikhao, Nai Yang and Nai Thon beaches. 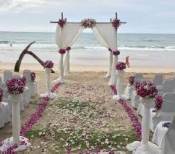 Mai Khao beach has another attraction that will see lots of visitors to this part of Phuket. Splash Jungle Waterpark is part of the Splash Beach Resort.. The waterpark is set on 3.5 acres and includes a 335 metre Lazy River, a Wave Pool, an Aqua Play Pool, the Super Bowl, and Boomerango ride as well as other waterslides that vary in height and speed. There is also an Igloo sauna or hot spring for the parents to relax in. The park is open daily from 10.00am to 6.00pm. Due to part of the beach being located within the Sirinath National Park , there has been little development at Mai Khao Beach apart from a couple of luxury Resorts and Villas. JW Marriott Resort and Spa is set amongst lush tropical landscaped gardens adjacent to the Sirinath National Park. There is a wide range of activities available including a fitness centre, Thai Wellness Sala, tennis and three swimming pools. There is also a selection of water sports such as kayaking, windsurfing, hobie cats, boogie boards and diving courses. 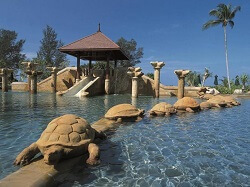 Marriott's Maikhao Villas are located next to the JW Marriott Resort and Spa. All of the luxury villas have two bedrooms and two bathrooms with private balconies. 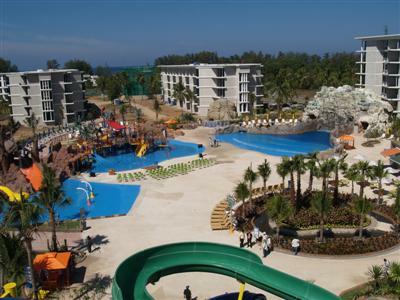 Splash Beach Resort is the ultimate resort to stay when travelling with kids. The resort features a waterpark with a range of waterslides and swimming pools. 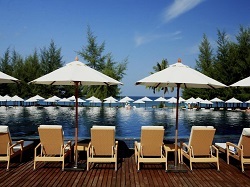 Holiday Inn at Mai Khao Beach is the ideal spot for a relaxing holiday in this peaceful area of Phuket. If your travelling on a budget and would like to stay directly on the beach at Maikhao have a look at the Seaside Cottages. Seaside Cottages & Restaurant at Mai Khao features unique round en-suite cottages or wooden and bamboo beach huts. There is only 10 rooms, so it is advisable to book. Unique Round Cottages with ensuite facilities, electricity, fan and king size bed, only 20 meters from the beach. There are only 2 of these round cottages with ensuites so advance booking is advisable. 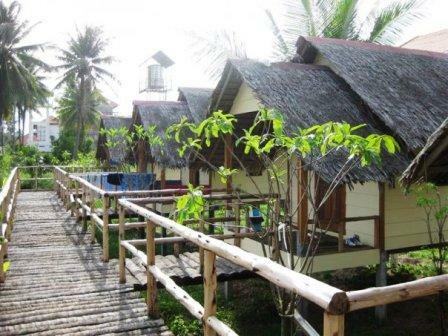 Wooden Huts near the beach are suitable for up to two people and include fans and lighting, king size mattress, all bedding provided with separate toilets & showers. The cottages provide comfortable budget accommodation in a fantastic location on one of our favourite Phuket beaches Maikhao. If this sounds like something that you would enjoy, you can have a look at the cottages on there website. Imagine how relaxing and laid back it would be lying back in a hammock looking out onto Mai Khao beach in such peaceful surroundings. If your looking for really cheap accommodation, camping is permitted on two Phuket beaches Maikhao and Nai Yang. The Park's Visitor Centrer, located near the southern end of Maikhao Beach, rents tents and provides some minimal facilities for campers. There are also some inexpensive bungalows for rent on Nai Yang. For more information see our hotels section to locate the right type of accommodation for your holiday in Phuket or alternatively view a range of other hotels and resorts in the search box below. 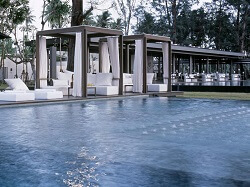 Dining at Mai Khao Beach is limited to either fine dining which is abundant at JW Marriott Phuket Resort & Spa. Or try one of the authentic bamboo and thatched beachside restaurants that serve Thai and seafood, located on the coast road north of Mai Khao Beach, just before the Sarasin Bridge. One of my favourites is Jakajan Seafood Restaurant the food is delicious and the prices are great. Kin Dee Restaurant is the best restaurant we found at Phuket beaches MaiKhao, owned and operated by an award winning Chef, Ton Pinnapa and her sisters. 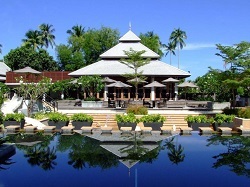 Serving Phuket cuisine, traditional, regional, seafood and vegetarian Thai, pasta and a good kids menu. Ton also has a Thai cooking school, classes are from 10.00am to 1.00pm. Next door to the Anantara Resort is Turtle Cove, here you will find some good restaurants like The Coffee Club which is well known for great food at reasonable prices. Open daily from 7.00am to 10.00pm. Or if you are looking for some good pub food, try Bill Bentley Pub, located on the 2nd floor of the Turtle Village. SALA Phuket Restaurant offers an exceptional blend of mouth-watering international cuisine and scrumptious traditional Thai delicacies. The restaurants serves fresh seafood, international and Thai cuisine. With a variety of dining venues including the main poolside dining area, air-conditioned restaurant, the poolside bar, the romantic rooftop, or under the stars at one of the candlelit beach tables. The main shopping area in Mai Khao is at Turtle Village, a boutique shopping and dining village located near the Anantara Resort. 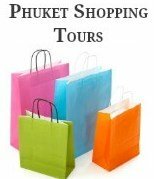 Shopping here includes a range of Thai silk garments at Jim Thompson, swimwear and lingerie at Triumph an optician, along with other clothing stores, gifts and souvenirs. Located in the basement is Turtle Mart a convenience store with a variety of fresh vegetables and fruits, groceries, milk, bread, pastries, snacks, drinks, beer, wine, newspapers and magazines. Opened daily from 8.30am to 9.30pm. 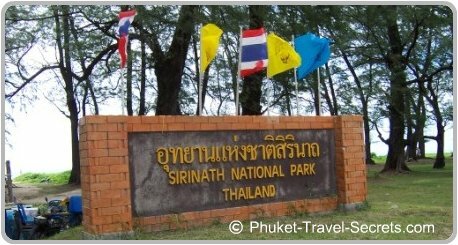 There are several access roads to Mai Khao beach, if you are heading south from the airport there is a road leading to Nai Yang beach, follow this road and it will lead you to the Sirinat National Park, then turn right. Or if you are heading north follow Phuket's main highway; route 402 which runs parallel to the beach, then take any of the roads leading to the left off the highway and they will lead you to the beach.